I was thinking about pressure recently, specifically how ambient (atmospheric) pressure affects the design of rocket nozzles, and I thought it might be interesting to find some chart or website which detailed the variation in ambient pressure in the operating regimes of rockets, i.e. from sea level to high earth orbit. I was not able to find any clear treatment on the matter, so I thought it might be interesting to write up a summary. Why does ambient pressure matter and why would it be interesting to know the pressure range over which rockets operate? The equation that characterizes rocket thrust is described below, with the accompanying schematic of a typical rocket nozzle for context. this will result in the maximum thrust achieved. Rockets will still operate across any pressure regime, but due to the pressure term in the thrust equation, the efficiency of the rocket may vary over an altitude range. Obviously when the exhaust pressure is less than the ambient pressure the pressure thrust contribution is negative. The variation of ambient pressure creates three primary gas-flow exhaust expansions. A nozzle can be under-expanded, perfectly expanded, or over expanded. The image below highlights these three cases. The space shuttle provides an excellent example of these expansions. At launch, the two solid rocket boosters (SRBs) and the three space shuttle main engines (SSMEs) ignite to power the shuttle to orbit. The primary role of the solid rocket boosters is just to get the space shuttle into the upper atmosphere which requires the most propulsive force. Each booster provides 12,000kN of thrust at sea level, increasing to 14,000kN before reaching the peak thrust altitude of 46km and separation shortly thereafter. Part of the thrust increase may be related to the lower pressure at high altitude, however in this case I want to call out the shape of the nozzle exhaust. It’s clearly under-expanded (see image below), and that aligns with the operating range of the SRBs which operate closer to sea level, and so a more optimum nozzle expansion can be designed. The SSMEs on the space shuttle however are clearly under-expanded at sea-level. This is harder to see in the image above, since the SSME burns liquid oxygen and liquid hydrogen which produce an essentially invisible exhaust (water vapor). The image at right shows the exhaust more clearly. This is because the space shuttle operating regime is primarily from ~100km to low earth orbit and so the nozzle geometry is optimized for efficient thrust in this range instead of at sea-level. At launch the maximum thrust at 109% is 418,000lbf, however in low-earth orbit the thrust at 109% can be as high as 512,300lbf. That’s significantly a function of the pressure thrust component. Since this altitude range has a much lower ambient pressure than sea level, at sea-level the nozzle exhaust is under-expanded; as the shuttle ascends the exhaust becomes perfectly expanded at some altitude and then over-expanded in low-earth orbit. In this example, the exit pressure of the Space Shuttle Main Engine nozzle is much less than the atmospheric pressure at sea-level, which crates the pinched effect, and the “Mach disc” in the nozzle exhaust. A Mach disc is a strong shockwave that creates a region of subsonic gas flow and produces the glow you see here. Nozzle expansion and shockwave effects can be a separate topic of their own, and won’t be discussed explicitly here. The effect of ambient pressure is clearly significant in the design of rocket nozzles. As will be shown later, staged propulsion, as in the case of the Saturn V rocket which launched the Apollo missions, allows for each stage to use a different nozzle/engine better suited to that operating regime. So why not build a nozzle that can adjust its exit area, A_e, or other characteristics to adjust for ambient pressure change? It was that thinking which spawned the design and development of a nozzle geometry that aimed to solve the same problem, except instead of using a complex mechanical system that could be prone to failure, it leverages a far simpler design. The aerospike rocket engine directs the exhaust around a central spike/ramp, where the exhaust flow is able to expand on the side open to the atmosphere, and self-adjust to changes in ambient pressure. This affords far more efficient operation across an altitude range. The atmosphere in this case essentially operates as the nozzle walls. The diagram below outlines the effects of lower and higher ambient pressures than exhaust pressure on the operation of an aerospike engine. Unlike a conventional converging-diverging nozzle, the aerospike is highly efficient across all pressure regimes. No aerospike engines are yet implemented, though many full-scale and working models for testing purposes have been built. In the 1990s Lockheed Martin was contracted to build the X-33 spaceplane, which would have been the first single-stage-to-orbit reusable space vehicle and used an aerospike engine, which we now understand as valuable given the operating altitude from sea-level to low-earth orbit (101.325kPa to 10E-11kPa). Unfortunately, the program was cancelled in 2001. Firefly Space Systems  is currently developing a rocket for small satellite launches which will also use an aerospike nozzle. That covers the background of this conversation about altitude and nozzle design, at a very high level. The following sections illustrate some examples of rocket propelled craft, the altitude and pressure range over which they operate, and should provide a compelling case for the need for smart design choices when selecting or designing the right rocket engine for a given application. There are various static atmospheric models that describe the pressure, temperature, and density at altitudes between 0 and 2,500km, however no comprehensive table of these values could be found. The 1976 U.S. Standard Atmospheric model provides data up to ~85km and the MSISE-90 model  provides an approximation of data up to 900km. Possibly the most reliable model for high-altitude (>1000km) atmospheric data is the 1999 NASA Global Reference Atmosphere Model (GRAM-99). The two charts below provide a rough approximation for how atmospheric pressure varies over altitude. The data used comes from the linked references here . Most people are familiar with the Bell X-1 rocket plane as the vehicle that Chuck Yeager piloted to break the sound barrier. The X-1 was also the first in a series of X-planes, American experimental rocket planes designated for testing new aviation technologies. As one of the earliest rocket planes, the X-series of aircraft were some of the first to experience flight trajectories operating within a large altitude, and hence pressure range. The X-1A set the altitude record of the series, when Maj. Arthur Murray flew it to 27,570m. Dropped from altitude of 7,600m, the rocket would have had to operate over a pressure range of 37kPa to 2kPa (277.5 – 15 Torr). Fewer people might be familiar with the X-15, a rocket plane built by Northrop Grumman which in the 1960’s was used extensively to assist with design and operation of spacecraft in the Mercury through Apollo program. The X-15 was the first operational spaceplane ever built. Designed to be drop launched from a B-52 mothership, the X-15 could attain altitudes in excess of 100km, and to this date remains the fastest aircraft ever flown, setting the speed record in 1967 at 7,273km/h. Neil Armstrong was an X-15 test pilot before joining NASA as an Apollo astronaut. The highest X-15 flight ever launched was to an altitude of 107.7km, piloted by Capt. Joseph Walker in 1963. Dropped from an altitude of 13.7km, this aircraft would have been operating in a pressure regime between 15kPa (112 Torr) and roughly 3E-2 Pa (2E-4 Torr). More recently in 2004, SpaceShipOne, which is another payload deployed rocket plane, piloted by Brian Binnie made a rocket powered flight to an altitude of 112km. 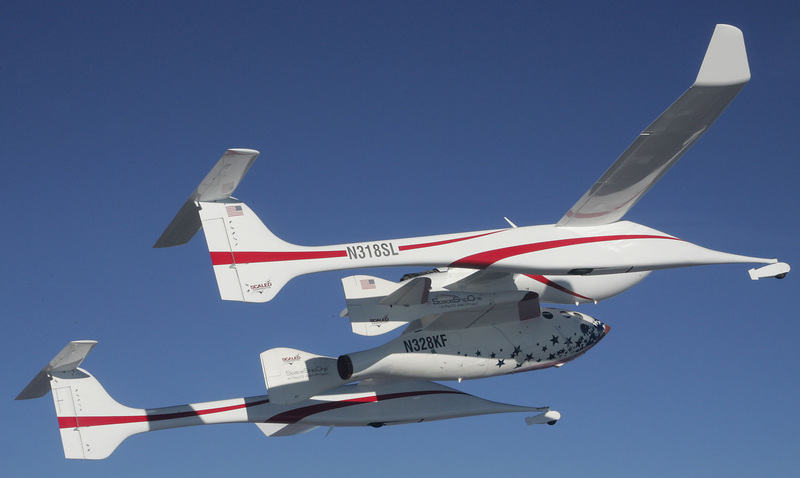 Flight 17P commenced with the jet-powered carrier aircraft White Knight, carrying SpaceShipOne to an altitude of 13.3km, before separation and ignition of SpaceShipOne’s rocket engine, which carried the vehicle to an altitude of 61km before engine cutoff. The spacecraft continued on its upward trajectory to 112.01km, breaking the record altitude set by the X-15 in 1963. The rocket engine on this aircraft would have been operating in a pressure range between 18kPa (135 Torr) and roughly 3E-2 Pa (2E-4 Torr). The examples illustrated so far peak at ~100km above the Earth’s surface. Spacecraft that continue upwards are in the process of a trans-atmospheric launch to some orbit above the earth. Perhaps one of the most well-known of these trans-atmospheric launches, Apollo 11, an American mission to place a human on the moon. On July 16th, 1969, a Saturn V rocket launched from Kennedy Space Center with Astronauts Neil Armstrong, Edwin “Buzz” Aldrin, and Michael Collins onboard. 6.4s before liftoff all five of the massive F-1 rocket engines of the Saturn V first stage (S-IC ) ignited, and 7,500,000 pounds of thrust sent the rocket upwards. 2 minutes and 15 seconds into flight, the center engine cutoff, and only 6,000,000 pounds of thrust were now sending the rocket careening into the upper atmosphere. At 2 minutes and 41 seconds, the outer engines also cutoff, as the rocket cruised past 205,000ft (62.5km). All of this takes place between 1-4 on the picture above, as the rocket engines were exposed to atmospheric pressure in the range from 760 Torr at the surface to 7.5E-2 Torr at altitude. At 2 minutes and 44 seconds into flight, the second stage (SII) of the Saturn V ignites and boosts the rocket to an altitude of 606,000ft (184.7km) 6 minutes and 19 seconds later. Numbers 6-10 in the initial trajectory diagram correspond to this stage, and the rocket engines, in this case five J-2 engines producing 1,000,000 pounds of thrust, operated between 7.5E-2 Torr at 62.5km to 1.4E-6 Torr at 185km. At 9 minutes and 12 seconds after launch, after separation from the second stage, the third stage (S-IVB ) engine ignites. Just one J-2 this time, which adds orbital velocity to the spacecraft, but doesn’t materially add to its altitude, boosting the vehicle only 1,000ft to 607,200ft (185km). This occurs between 12-14 of the orbital diagram and there is no change in ambient pressure. Beyond this point, the Apollo mission continues onwards, to the moon, however the variation of atmospheric pressure on this journey contributes significantly less to any nozzle operation, so we won’t continue beyond the third stage operation. Note though that the engines on the first and second stage operated in significantly different pressure regimes, and some research would indicate how significantly different the F-1 and J-2 nozzle geometries are, as they optimize their design condition. One more example; the Minuteman-III, which is an intercontinental ballistic missile (ICBM) on active status in the United States military since the early 1970s. It is one of two long range ICBM’s (the other is the Titan-II submarine launched ICBM) used for nuclear deterrence. There are approx. 450 listed on active status in 2015. As an ICBM it achieves its long range and short time-to-target capabilities by a launch to a low earth orbit which allows it to travel incredibly far distances. This is how all ICBMs operate, by reaching low-earth orbit the vehicles travel farther and faster than through the lower atmosphere. This requires more detailed knowledge and design on the part of operators and builds of these machines, but the availability of low-earth orbit rockets was what made possible the space program, as the early manned-spacecraft were launched on derivatives of these military rockets. A diagram of a Minuteman-III launch is depicted below. Stage 1 will thrust within an atmospheric pressure range or 760 Torr (sea level) to 8.17 Torr (100,000ft/30.48km). Stage 2 then ignites and boosts the rocket to 300,000ft (91.4km) where the ambient pressure is 2.8*10-3 Torr. The third stage will thrust until the rocket reaches an altitude of 750,000ft (228.6km) which is well into the low earth orbit range, and the ambient pressure is 4.8*10-7 Torr, at which point the rocket will cut off and the rocket will continue to coast to an apogee in excess of 1,200km before falling in a ballistic trajectory back to Earth, and it’s intended target. Finally, beyond trans-atmospheric launches to orbit, there are the orbits themselves. There are essentially three kinds of earth orbits; low earth orbit, medium earth orbit, and geosynchronous/geostationary orbit. Some satellites are placed in still higher orbits, especially those around lagrangian points for more sun-based observation, but those won’t be discussed here. Most scientific satellites, such as NASA’s Earth Observing System fleet, operate in this range, many in a polar orbit where the satellites orbit around the earth in a more longitudinal direction. This allows the satellite to image a full band of the earth and because they are moving so fast and the earth moves beneath them, they can constantly image adjacent bands of the earth which make them ideal for weather imaging. Example of polar orbits for weather satellite imaging . Several well known satellites have been placed into LEO. Navigation and specialty satellites designed to operate over a particular region operate within this range. There are two common orbits in this range. The semi-synchronous orbit, is a near-circular orbit 26,560km from the center of the earth, ~20,200km above the surface, and satellites at this height orbit in 12 hours and so cross the same point on the equator twice a day. This is used by GPS satellites. The Molniya orbit is used to observe high latitudes for long periods at a time, which are otherwise difficult when a satellite has to remain over the equator. The Molyniya orbit is very eccentric, and can have an altitude range of 500-40,000km. USA-213 is an example of a GPS Satellite, launched on 5/28/2010 to an altitude of 20,460km. At this altitude, it is in a semi-synchronous orbit where the ambient pressure is around 10-14 Torr. The small rocket thrusters on this satellite which will keep it in orbit will be designed to be maximally efficient, taking into account this operating ambient pressure. When a satellite reaches a point 42,164km from the earth’s center, 35,786km from the surface, the satellite will orbit at a rate which matches the earth’s rotation. This will result in the satellite remaining in the same point over a given longitude on the earth. Due to the tilt and rotation of the earth however, if the satellite is not placed in orbit over the equatorial latitude at this altitude, it will have a tendency to drift over a range of latitudes. This is a geosynchronous satellite. Geostationary satellites are those which remain over the same point on earth’s surface because they are at the correct altitude and orbit around the equator. Examples of the pressure at the boundaries of the major Earth orbits are described in the table below. It is important to understand how ambient pressure varies across the operating regime of any given spacecraft, and this should be considered in the rocket engine or nozzle design. In some cases, weight or momentum thrust may supersede pressure thrust optimization, however in others, a staged rocket with different nozzle geometries may be desired, or a new nozzle geometry like the aerospike engine. A satellite in geostationary orbit will have travelled through a pressure range from 10E5 Pa to 10E-14 Pa, and the rockets that will get it there, have two components, momentum, and pressure thrust.